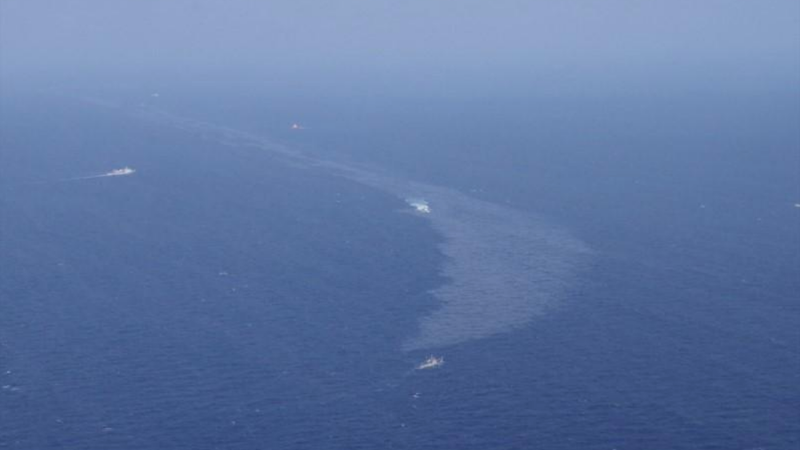 As feared, oil from a sunken Iranian tanker has reached the shores of over a dozen southern Japanese islands, Japanese Coast Guard officials have now confirmed to Reuters and AFP. The Sanchi sank on January 14 after colliding with a Hong Kong-registered freighter in the East China Sea, spawning four giant oil spills. Packed with 1,000 tons of diesel fuel and 110,000 tons (810,000 barrels) of ultra-light crude condensate, it’s considered the worst oil tanker disaster in decades. Much of the fuel evaporated after the ship caught fire and sank, but the slicks raised fears of an environmental catastrophe. Three bodies were recovered during the incident and the 29 missing Sanchi crewmembers are now presumed dead. The first traces of oil washing up on Japanese shores started to appear on January 28, when greasy sludge was found on the beaches of Takarajima island. Oil was spotted on the shores of the Okinoerabu and Yoron islands in the Amami chain (a part of the Ryukyu Islands) on February 8. Upwards of 21 islands in southwestern Japan have now reported oil on their beaches, reports Reuters, including Amami-Oshima and Okinawa—which are known for their beautiful beaches and extensive reef systems. In all, nearly 100 tons of oil have been cleaned up by residents, according to AFP. A large oil slick near the tanker continues to linger, and is parked about 200 miles (315 km) west of Amami-Oshima island (an island at the edge of the East China Sea), but the Coast Guard says is steadily evaporating. As early as January 17, Japan’s environment ministry said it was unlikely that any oil would reach Japanese shores. That was a strange prediction to make given the proximity of the spill to Japan, and given that simulations produced by the National Oceanography Center showed a high probability that the oil would eventually reach southernmost regions of Japan. Updated simulations produced by the NOC in February (shown above) suggested the oil would reach the coral reefs in the Ryukyu island chain, which has proven to be the case. The environmental impact of the spill is still not known, and it could take months, if not years, to properly assess any damage done.